Crispy Varagu Paper Roast/ Kodo millet Paper Roast is made of healthy Kodo millet /Varagu siruthaniyam. I have already posted step by step instructions on preparation of Varagarisi Idli batter, first day after fermentation you can make idlis and next day you can use the same batter to prepare Dosa. For other millet Thinai, saamai, kuthiraivali, panivaragu recipes, click here. 1) Add few water to Varagu Idli batter and dilute it to get Dosa batter consistency . 2) Heat the dosa tawa and grease with little oil. Take a ladle full of batter and spread it fast in circular motion. Drizzle more oil on sides and close it with a lid to cook the dosa in medium flame. 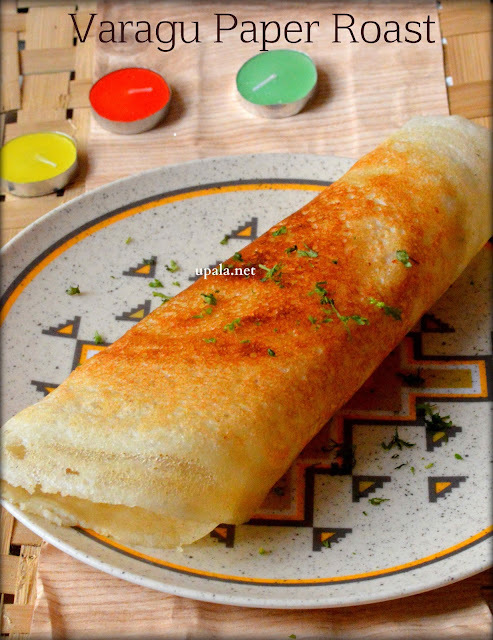 3) Open the lid after few seconds to check whether the lower side of dosa has turned light brown. Now increase the flame to high just for 2-3 seconds so that the edges turn crispy and lift up from the dosa tawa. Lower the flame and remove the dosa carefully with dosa spatula. Crispy Varagu Paper Roast is ready. Serve hot with sidedish. 1) You can also cook the dosa without closing, but make sure to flip it around to cook the other side. 2) Drizzle few ghee to make it ghee roast. 3) To spread thee dosa batter fast over tawa, you can use a flat ladle as shown in picture or flat bottom stainless steel cup (used for serving chutneys). 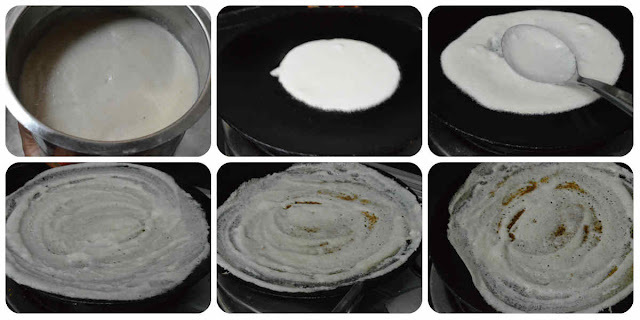 4) You can move the dosa tawa slowly to all the edges over burner so that the edges also gets heated evenly. This needs practise so do not perform if you are first timer.